Bolivia has a diverse economy, wealth of natural resources and the potential to grow into a tourist hotspot. If you’re looking for a unique South American vacation, pack your bags, buy Bolivian boliviano and head down to one of South America’s most exciting countries. Early in its history Bolivia used the Spanish colonial real before it was replaced at parity by the Bolivian sol. 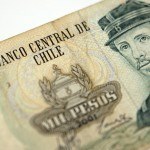 In 1864 the first boliviano was introduced at a value of 8 soles to 1 and pegged to a rate of 1 boliviano to 5 French francs. In 1908 the currency was put on the gold standard at a rate of 12 ½ bolivianos to 1 British pound. By 1928 the boliviano was devalued to a rate of 12.5 bolivianos to 1 British pound, then was reduced further to a rate of 80 to 1 in 1936 and eventually 160 to 1 in 1939. In 1963 the boliviano was replaced altogether at a rate of 1,000 to 1 by the peso boliviano (BOP). Just 20 years later in 1987 the BOP itself was replaced by the boliviano at a rate of 1 million to 1 giving it a value of 1 to 1 with the USD. The boliviano was first subdivided into 100 centécimos later renamed centavos (cents). In 1864 1/20, 1/10, ⅕ and 1 boliviano coins struck from silver were introduced as well as copper 1 and 2 centesimos coins. 5, 10 and 20 centavos coins were introduced in 1870, 50 centavos in 1873, and copper 1 and 2 centavos in 1878. 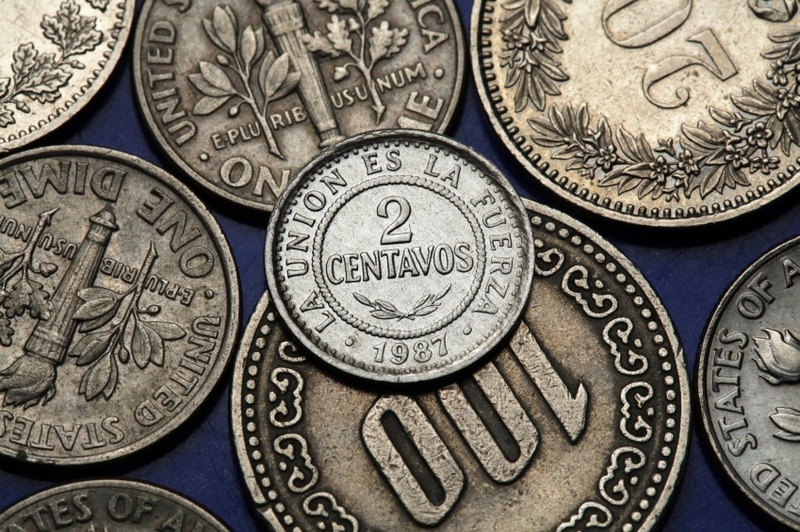 In 1879 the last 50 centavos coin was struck and after 1883 the last 1 and 2 centavos coins were discontinued. The 5 centavos coin was last struck in 1936 and after 1942 no coins below the value of 1 boliviano were minted. 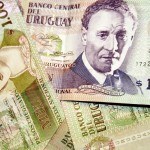 Banknotes were first introduced by the Banco Nacional de Bolivia in 1873. This first series included 1, 5, 10, 20, 50 and 100 bolivianos. Two years later 20 and 40 centavo notes were introduced. Eventually, after rapidly rising inflation Bs. 5000 and Bs. 10,000 notes were introduced in 1942. After the boliviano was reintroduced at a rate of 1 million to 1 in 1987 a new series of coins was circulated. Cvs. 2, 5, 10, 20, 50 and Bs. 1 coins were minted in 1988 followed by Bs. 2 in 1991, Cvs. 10 in 1997 and Bs. 5 in 2001. The Bs. 2 was minted in two different sizes, both of which are legal tender. 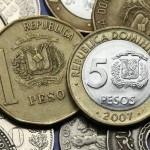 All coins are inscribed with the value of the coin and the phrase “La union es la Fuerza” (“Union is strength”). In 1987 Bolivian peso banknotes were overprinted with the reintroduced boliviano in denominations of Cvs. 1, 5, 10 and 50 and Bs. 1, 5, 10. Soon after Bs. 2, 5, 10, 20, 50, 100, and 200 were introduced. The Bs. 2 and Bs. 5 notes were replaced by coins in 1991 and 1995 respectively. 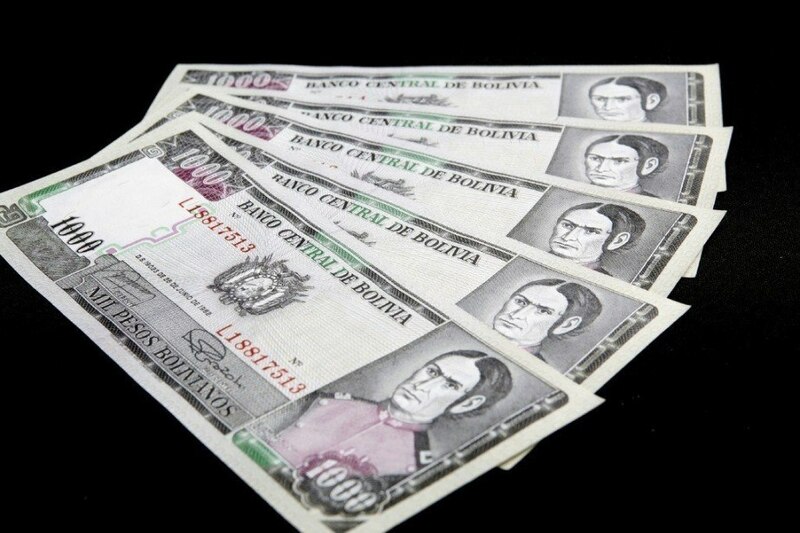 Boliviano notes come in a range of colours including: blue (Bs. 10), orange (Bs. 20) purple (Bs. 50), red (Bs. 100) and brown (Bs. 200). All are watermarked with an image of Simón Bolívar. The Bs. 10 bill has an image of painter Vevillio Guzman with the city of Cochabamba on the reverse. On the Bs. 20 is an image of Pantaleon Dalence – considered the Father of Bolivian Justice – and an image of The Golden Colonial House of Tarija on the reverse. Painter Melchor Perez is depicted on the obverse of the 50 with the Tower of the Church of the Society of Jesus in the city of Potosi on the reverse. Historian Gabriel Rene Moreno is on the 100 with the Mayor Real and Papal University of Saint Francisco Xavier of Chuquisaca on the reverse. Former president Franz Tamayo is on the front of the 200 with a depiction of the empire of Tiahuanaco on the reverse. After years of rampant inflation devalued the Bolivian peso, the Bolivian boliviano was reintroduced on par with the USD and allowed to float freely. Over time this parity has eroded but the new currency has remained far more stable than its predecessors. Bolivia’s economy is healthy and growing, with public debt sitting at 35.3% of GDP and a B+ credit rating. Mining, petroleum, food and beverage production, textiles, jewellery and smelting all make up important components of Bolivia’s economy. Services make up 52% of the country’s GDP, industry just over 38% and agriculture just under 14%. Agriculture and forestry once made up almost 30% of Bolivia’s GDP in the 1980’s, but have decreased as a percentage over time as other sectors of the economy have grown. Gold, tin and silver mining continue to be important components of Bolivia’s economy while natural gas has also gained an increasingly vital role in the country’s energy sector. Lithium, a crucial component in modern batteries, is also found in larger quantities in Bolivia than almost anywhere else. In fact, Bolivia has 3 million tonnes of known lithium reserves, compared to just 410,000 in the United States. Tourism has not been as lucrative in Bolivia as perhaps it should be. The country boasts some truly spectacular natural attractions as well as a rich history and culture. Historical instability and corruption has hampered the industry in the past but reforms to minimize corruption have benefited all aspects of Bolivia’s economy and the tourist industry has grown slowly but steadily over the last few decades. Bolivia’s natural resources have been a major source of income for its entire history, and that trend looks set to continue thanks to a mix of gold, silver, fossil fuels and lithium deposits. The boliviano has achieved a level of stability unmatched by its predecessors which should serve as a stable base for future economic success. If the country continues to win the fight against corruption and can capitalise on its tourist potential, Bolivia should enjoy a bright future. Whether you need to buy Bolivian boliviano or any other of over 160 different currencies, we’ve got you covered at your nearest Continental branch! You can also order a large selection of different currencies for pickup or delivery with FXtoGO! Don’t forget track the exchange rate of your favourite currency with Rate Watch. For a broader understanding of Bolivian history and culture check out our Country of the Week profile. For information about traveling to Bolivia then be sure to follow our Travel Guide.